A looming of Vultures is a fine mesh of two artists. Storry creates a world filled with quirky characters, and Urry brings it to life. The story is set in an imaginary country, that feels just as real as luxembourg. It is populated by some shady characters, and the mood bounces from light to dark swiftly. One minute you have a who's on first tye back and forth between Rudolf and Wilhelm, and in the next a nefarious event has taken place. Murder, mystery, theft, and so drive the tale forward. Storry's writing is smooth and flows like water down a mountainside. His characters are complex to a point hat you'll believe they are real people. The setting, although fictional, has an air of life to it, and you'll find yourself looking at a map to see exactly where it is. Urry brings a formidible set of tools and puts them all to good use. He is dry when he needs to be, or cutting like a blade when wit is required. His voice just sets a mood, and you can feel the fog and shadows of a good mystery envelope you. I am very impressed with this first book, and look forward to the next in the series. What an entertaining listen! An aristocratic thief, a treacherous murder plot and scrumptious baked goods - sounds like fun to me. Will Rudy finally learn his lesson or is he beyond redemption? Will the assassins succeed or will an unlikely hero save the day? Listen and find out! I really enjoyed this story. The dialogue between Rudy and his manservant was hilarious and they definitely had an interesting relationship. The action and suspense had me captivated. As for the narration, you can always count on it being great with Jake Urry as the narrator. I would recommend this. A baron with a penchant for taking what he wants in the dead of night as a gentleman’s hobby. A manservant who is along for the thrills and to keep his master safe. Along comes a challenge that can’t be ignored in the form of a safe full of gold deemed uncrackable by the makers. As the crime unfolds a plot to assassinate the king is uncovered, due to his nature he cannot reveal what he knows. What an two rogues do? Listen and find out. I was voluntarily provided this free review copy audiobook by the author, narrator, or publisher. 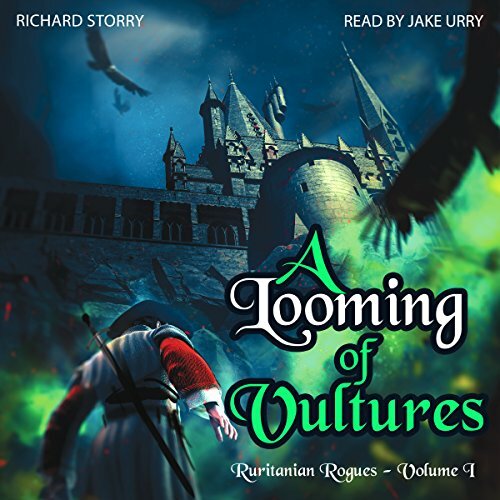 Ruritanian Rogues Book 1 “A Looming of Vultures” By: Richard Storry is a bit outside my normal genre, however, I really enjoyed the story. There’s loads of action and suspense, with enough humor to keep things fun and a twist to keep things interesting. Narrated by: Jake Urry who does an amazing job bringing individual characters to life. Highly Recommend! Loved the sarcastic humor throughout. The twists and turns holds your attention to the end. Jake Urry, narrator, knew his characters well. This story was very interesting. Initially it started out like it was going to be all about royalty and the lavish events they throw. Then it began to morph into a who-dun-it mystery. But it is not a who-dun-it. I can't say more without giving it away, but the plot twists and morphs and in the end, I found myself smiling and anticipating where the flow of the story would go. Very well thought out progression, I am definitely looking forward to book two. The narration was executed very well. Jake Urry did a fantastic job with the many different voices and characters. His narration really brought the story to life. I would recommend this book to anyone who is a fan of mysteries or anything with a twisty plot and surprise endings. I also like the short bookend story about the Vulture and his flight for food. Feels like historical fiction - very entertaining! This was a fun listen! Rudolph (Rudy) enjoys relieving high society individuals of their valuables. I think he does it mostly out of boredom. His manservant, Wilhelm (Willy), has tried everything he can think of to break him of this bad habit. This situation provided plenty of humor throughout the story. At a fancy dinner party, an expensive necklace goes missing and this newspaper reporter gets blamed but perceptive folks don’t truly believe he stole it. Rudy has a naughty laugh up his sleeve because he knows exactly who took that necklace. Meanwhile, Willy is trying really hard not to roll his eyes at this while others are around. So this baron or count or some such decides to take extra precautions concerning his safe. He brings three others into the plan, including Rudy because he believes he is an honorable man. Of course, this just presents a challenging opportunity for Rudy to get rich. Willy once again tries to persuade him not to do so… including threatening to never, ever make Rudy his favorite chocolate tiffin ever again. Ha! This story had me chuckling at every turn. So while I know I shouldn’t root for Rudy, I didn’t want him caught and punished either. Luckily, the story gives us a true villain. There’s murder and deception and politics! Rudy and Willy inadvertently get drawn into this and when pushed up against the wall, they have to decide where that moral line is. My one criticism for this story is that the ladies don’t really get to do anything. They flutter about in expensive sparkly jewelry and tell their men how clever they are. Really, you could have left them out all together and the plot wouldn’t have been impacted at all. So I would have liked some real female characters. Overall, this story was a delicious mix of humor and serious crime. The play between Willy and Rudy was great and often had me laughing. Rudy is a bit of a scoundrel but I can see him taking on greater things, especially if there’s a bit of silver or gold in it for him. I love that the author included a recipe for the chocolate tiffin. 4/5 stars. The Narration: Richard Urry was excellent in performing this book. He has distinct voices for all the characters and his lady voices are feminine. I loved his voice for Willy as I could just picture all the facial remarks this character made (rolling eyes, grimacing, etc.). Also, there’s a recipe at the end of the book and Urry proves that he’s delightful to listen to no matter what he’s reading. 5/5 stars. Ruritania, a country described as laying somewhere East of France and the North of the Mediterranean, has been for a long time at war with Germania. In the midst of this tumult, the upper class is worried about some thefts occurred recently, and the best way to prevent them. It is not specified when the events in this book occur, but the mention of electricity as a novelty and only within reach of the king, it could translate into late 19th century or early 20th. Being Ruritania an imaginary country, I couldn't help by try to guess in what countries it was inspired. Some names sounded Russian, but other could also have been Prussian. I know this is not relevant to the story but I always wonder about these things! This book was really enjoyable. The characters were very well depicted, and each one had their own quirks. I especially liked the weird pair formed by Baron Rudolf and Wilhelm, with their never-ending arguments to the point that they resulted really endearing. I didn't share the motivations of the characters but I could understand them and I think Storry did a really good job in creating very vivid characters with down to earth imperfections that made them real. The plot was cleverly exposed and had a nice pace. The book had me really entertained for more than the first half just to be surprised with interesting twist. I guess this is exactly what happened to the upper class of Ruritania, too busy with meaningless things (but important to them) to be able to see what was really in front of them. Some things were not explained, like how the bad guys managed to do what they did, but this is part of the charm of this story, which feels sometimes like a fairy tale. I loved every moment of this it, and I enjoyed being distracted by a clever plot, like the people from Ruritania. Jake Urry's performance was, as always, wonderful. He really brought the characters to life giving the impression of facing real people. He set the right atmosphere with his poweful and velvet-like voice, transporting me to a far away country. Urry has become of of my favorite narrators! The lives of the landed gentry in Ruritania seems like an episode from Downton Abbey! I adore the language and the etiquette employed. The gentleman burglar is so endearing, I know I should abhor his behaviour, but I simply couldn't bring myself to dislike anyone so fond of chocolate tiffin! Of course, the exquisite language was enhanced by the narration of Jake Urry - a man who's voice can be likened to liquid chocolate. There doesn't exist a word, story or tale that cannot be turned into a masterpiece by the addition of Mr Urry. I'm thrilled to recommend this tale, it's simply lovely! Delicious in every way, this book of dirty deeds amongst the grandeur of Ruritanian nobility has echos of the gentleman thief books of Raffles and sidekick, Bunny. Gloriously written by Richard Storry, a visual and gastric delight providing a colourful background to the amusing story of thefts and double dealing. There is even an end recipe for the delectable chocolate Tiffin. Simply to say that it is narrated by Jake Urry should be enough. His excellent narration with just a twinge of the sinister gives this sumptuous and whimsical tale the needed gravitas. Perfectly read, as always, he voices the characters and paces the text perfectly, his reading not disguising the inherent humour. Good story, definitely fun and definitely recommended. A thrilling storyline penned from the amazing imagination and writing skills of Richard Storry exquisitely narrated by the skills and luxurious vocal tones of Jake Urry. Let your imagination run free through this brilliant story of fiction. I love how the characters interact with each other and if you want a tense, edge of your seat tale, then listen to this. The land of Ruritania is laid out in vivid and colourful descriptions, showing both the good and bad sides, even the upper classes aren’t as safe as they think they are, even from their own kind. It’s years since I have read anything in this vein - a story that just makes you want to go on and on listening...forget work, blow the housework, can the chores...I just wanted to be immersed in the story. Characters are brought to life by the wonderful voice and narrative shaping of Jake Urry; and the personalities of the protagonists are depicted with finesse. I feel sure that this Ruritanian saga is just the beginning of many; and I really hope to see more of Rudi, Wilhelm, the sumptuous banquets and above all, the atmospheric setting of this magical land. If you could sum up A Looming of Vultures in three words, what would they be? Colourful descriptions of another time and place intertwined with an intriguing plot. Creates a foundation for a good series of books. Which character – as performed by Jake Urry – was your favourite? Will be reading the next in the series.